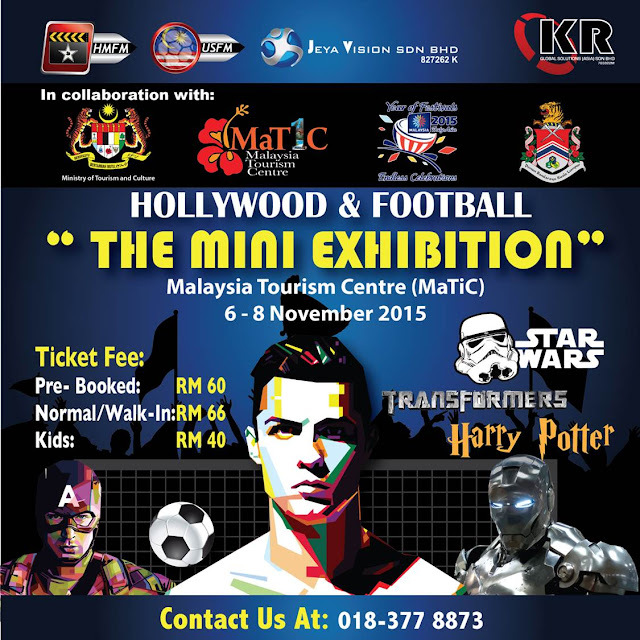 In conjunction with with Malaysia Tourism Centre (MaTiC) for the MaTiC Street Art Festival 2015, there will be a Hollywood & Football “The Mini Exhibition” presented by Private Collector Club (PCC). It will take us into the wonderful world of Hollywood movies and the global arena of football. This exhibition from 6th to 8th Nov 2015, starting from 10am to 10pm at Malaysia Tourism Centre, Jalan Ampang, Kuala Lumpur. Through the exclusive platform of Hollywood Malaysia Flash Museum (HMFM) and United Soccer Fandom Malaysia (USFM), PCC will be providing a rare glimpse of rarely seen Hollywood Movies Memorabilia and high-end football memorabilia. For Hollywood movies fans, 6 themes of Hollywood Movies will be exhibited; as such of Star Wars, Harry Potter, Transformers, Ironman, The hobbit and Annabelle. For football fans, memorabilia’s from the English Premier League; as such of Manchester United FC, Chelsea FC, Arsenal FC and Liverpool FC to winners medal and trophy. The 3-day mini exhibition will also have activities such as character walk-about and picture taking, win iPhone’s through our social media participation, Hollywood movie gift pack and also a lucky guest will walk away with an Exclusive Hand Signed Cristiano Ronaldo Jersey for lucky draw contest. Apart from that, there will be a retail section where we will retail Exclusive HMFM & USFM merchandise. Tickets are priced RM66 for adults and RM44 children. For those who pre-book their tickets, get a 10% discount.